The .32 ACP cartridge was the famous John Browning's first cartridge design meant for firearms with a small profile, allowing the firearms using that cartridge to operate with a straight blow back design. Since its creation it has been used by many military forces and police agencies all around the world. This 73 grain full metal jacket projectile is the perfect choice to use on the range. Its affordable, and reliable which is some of the best criteria to consider when choosing a practice round. Fiocchi pulls this off by using all newly manufactured components, and a great level of quality control. If you are looking to stock up and save some money, don't forget to see if we have 1000 round count of this same 32 ACP ammo available of this product to keep you on the range longer! 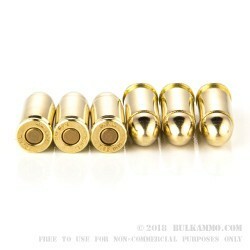 Q: Would this ammo work well enough in a .32 revolver? A: Unfortunately these rounds will not work for a .32 revolver. 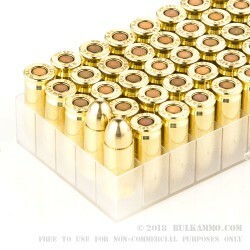 These cartridges are "semi rimmed" for loading into a semi-auto pistol. This rim will not be great enough to be stable in a revolver. Most 32 caliber revolvers will require the "32 S&W" ammo which will feature a rim large enough to safely function in a 32 caliber revolver. Q: I have a VZOR 70 and would like to know if this would be the best ammo to use for personal protection or would the JHP type be better? Thank you. A: This is up to you. 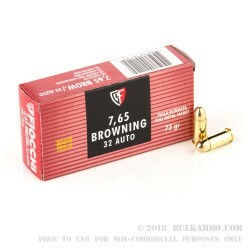 .32 ACP hollow points generally do not penetrate very far in tissue, but might penetrate far enough to get the job done. 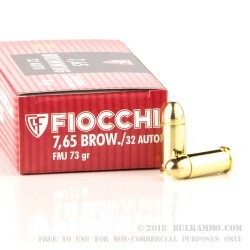 .32 FMJ bullets, by their very nature, will not expand or deform unless they hit bone or other hard objects. Your pistol might be more reliable with FMJ ammo, making it a better choice for you.